The Alpine Rhine Valley is a hot spot: For biodiversity it is very important as many plants and animals use it as an important migration route. For mankind it is a functional place where agriculture, forestry, energy production and other uses intensively take place. Therefore interests in the Rhine Valley between Lake of Constance and Chur are controversial and it is often not easy to reach a broad agreement. What is missing is a “social” integration of all stakeholders. 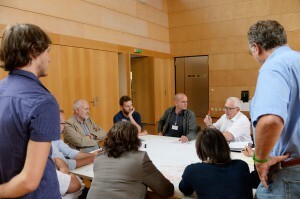 On September 2nd 2014, CIPRA International brought together about 30 persons from administrations, municipalities and NGOs in the framework of a workshop in Mäder, Austria, to discuss and debate about the area of the Alpine Rhine Valley. Participants had the opportunity to exchange views on different projects and to explore common solutions, projects and opportunities. CIPRA summarised the existing projects, initiatives and publications in a report (only in German): „Biodiversität und nachhaltige Raumnutzung im Alpenrheintal – Übersicht zum Stand der Dinge“. A new wildlife corridor should help to improve ecological connectivity across the Alpine Rhine valley. Within municipalities not built-up areas should be maintained by implementing new forms of living. The „sample hectare“ concept can be used to visualise different options for use and can support decision making. All presentations and workshop results are available here.